One of my Christmas gifts from my in-laws this year was an electric toothbrush. No, they weren't trying to subtly hint anything...I asked for it! Now that I've been using it for a month and a half, I can confidently say that I really like the contraption. You certainly can't beat that 'fresh from the dentist' feeling you get twice a day! However, I'm still struggling with the apparent learning curve that exists in the transition from a traditional toothbrush to an electric one. For starters, how the heck do you use it without drooling all over the place? I swear, I'm keeping my head lifted high and my mouth mostly closed and I cannot brush without ending up with foamy toothpaste spit all over my chin, the sink, and my shirt! Any tips would be much appreciated! And while we're on the subject of tips, how the heck do you know how long is long enough to brush? I feel like I could stand there for twenty minutes brushing (imagine the mess THAT would create!) and still feel like I hadn't spent enough time on each tooth. I never felt this way with a normal toothbrush--what is wrong with me?! I don't really have a good segue from my current teeth-brushing woes to this salad, except to say it has quite a few strong flavors that might warrant a toothbrush when you're finished! This is so different from most vegetable salads. For one, it involves curry powder, a spice I don't pull out of the pantry often enough! For two, you roast the green beans instead of steaming or boiling them. Throw some homemade croutons in there and serve it with the lemon Greek yogurt sauce.. Serve it warm from the oven or at room temperature (I made the sauce, toasted the bread, and roasted the vegetables ahead of time and then refrigerated until ready to eat), mix the sauce with the vegetables or use it as a dip, either way you have a unique side dish! 1. Preheat oven to 425F. 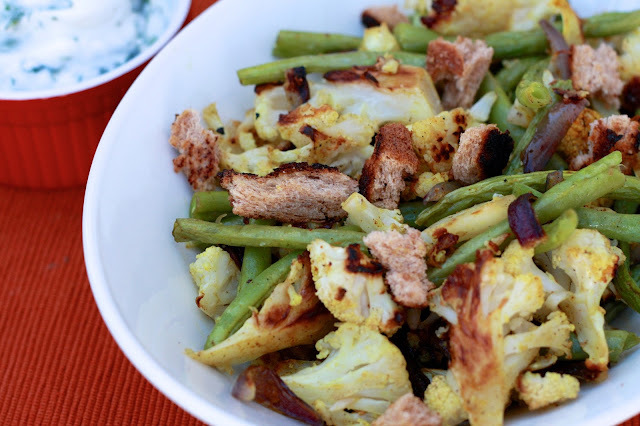 Toss cauliflower and onion in a large bowl with 3 tbsp of olive oil. Season with salt and pepper. Spread vegetables on a baking sheet lined with foil. In the same bowl, toss beans with remaining 1 tbsp olive oil and season with salt and pepper. Spread the beans on a small baking sheet lined with foil. Roast vegetables until crisp tender and lightly browned, stirring once or twice (14 minutes for beans and 16 minutes for cauliflower/onions). Return vegetables to bowl to cool. 2. Meanwhile, in a medium skillet, heat the vegetable oil. Add the bread pieces and cook over moderate heat, stirring, until golden and crisp (about 5 minutes). Transfer to a plate to cool and season with salt. 3. In the same skillet, toast the curry powder over moderate heat, stirring constantly, until fragrant, about 2 minutes. Scrape the curry over the vegetables, season with salt and pepper, and toss to coat. 4. 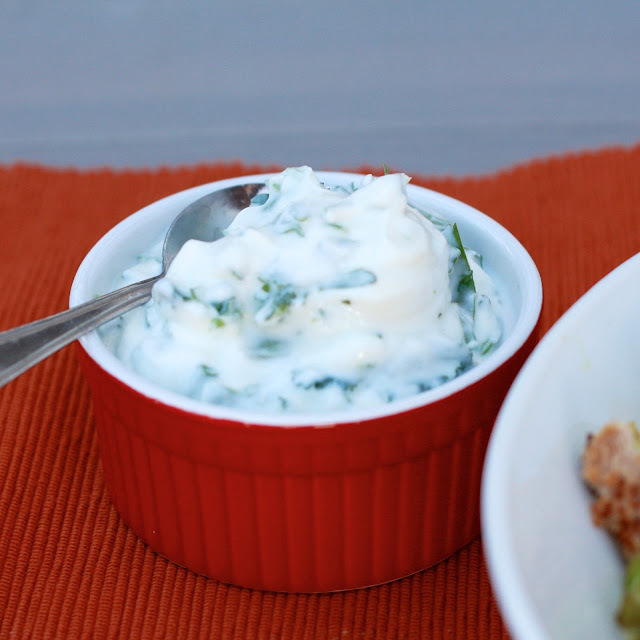 In a small bowl, combine the yogurt with the lemon juice, cilantro, and garlic, and season with salt and pepper. 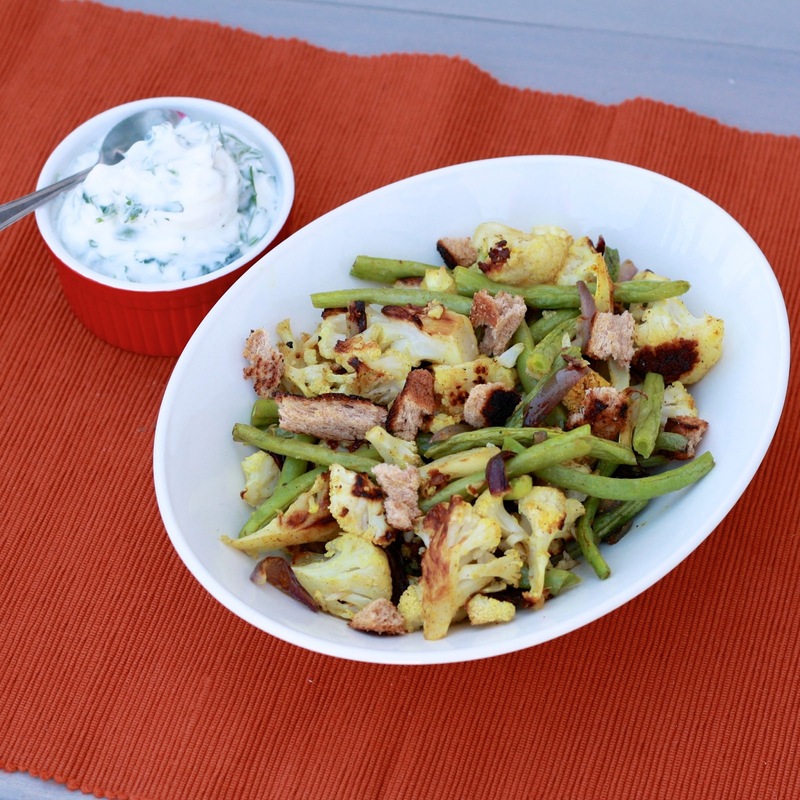 Sprinkle the vegetables with the croutons and serve with the yogurt sauce. *Vegetables and yogurt sauce can be made a day ahead of time and refrigerated separately overnight. Croutons can be kept in an airtight container at room temperature overnight.